YOKOHAMA　（The Asahi Shimbun on June 13, 2016 by MINAO OTA） --Baseball clubs linked by a history that stretches back 120 years met on the diamond June 11 to commemorate a game played in 1896 that is credited for creating Japan’s passion for the sport. Cheered on in Japanese and English, former members of the University of Tokyo baseball team took on a team representing the Yokohama Country & Athletic Club here to celebrate their first meeting more than a century ago. Baseball first caught on in the nation after students from the University of Tokyo--then known as the First Higher School of Tokyo (Ichiko)--and a team of foreign nationals with YC&AC played each other in this port city on May 23, 1896. 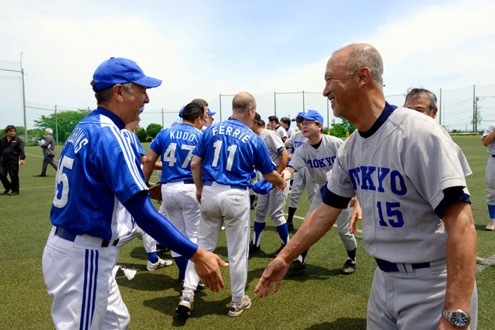 The Ichiko team came out on top 6-5 in the commemorative game on June 11, but the day was all about friendship and remembering the long-shared history between the two teams. The players that took the field that day ranged from teenagers to those in their 70s. The YC&AC was established in 1868 by residents of the foreign settlement set up near Yokohama Port, which had just opened to international trade after the end of the nation's isolationist policy during the Edo Period (1603-1867). Ichiko clobbered YC&AC 120 years ago. The score of 29 to 4 was a staggering victory for the Tokyo school that was widely reported by the media at the time, setting off the nation’s baseball craze. Ichiko and YC&AC met again in June 1896. Cheered on by students from the Yokohama Commercial High School, commonly known as Y-ko, the Tokyo team was victorious once again. After the game, the victors gave bats and balls to the Y-ko students, which led to the birth of the school’s baseball club that continues to this day. The team often participates in the spring and summer high school baseball competitions at Koshien Stadium. After the Ichiko game on June 11, the YC&AC nine took on a Y-ko alumni club team. Y-ko won 16-11. Mr. Mike Galbraith, the YC&AC’s historian, British and former YC&AC rugby captain wrote in his “LEGENDARY 1896 YC&AC vs, ICHIKO BASEBALL GAMES” says “Baseball’s rise to ascendancy as Japan’s most popular western sport began in 1896 when four baseball games played between May 23 and July 4 - three on the YC&AC’s cricket ground in the center of what is now Yokohama Koen/Park and one in Tokyo – rocketed the level of Japanese interest in the sport, game by game. “ We are grateful to Mr. Galbraith for his agreement to publish the full text of his paper on this website.